With the continuous evolution of technology, the experience of connecting with friends and family has been made easier than ever before. Webcams and front-facing cameras as well as services like Skype, Facebook Messenger, and Snapchat are available on every mobile device now, making video chatting with others much more accessible. Those utilizing these services have the benefits of this communication technology including establishing more personal and trusting relationships through contacting each other, and conquering the lack of facial cues and body language as found in audio calling.1 However, a new and more unique method of interacting with others is surfacing: virtual reality. Virtual reality (VR) is created when 3D computer-generated graphics emulate a “near-reality” environment where users can explore, interact with, and feel immersed in that world. 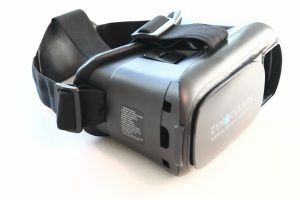 The VR experience occurs through headsets with unique lenses that are placed over the eyes. These headsets vary in price, ranging from affordable smartphone compatible headsets to specialized VR equipment. Many high-profile tech companies like Google, Facebook, and Microsoft consider VR as a transformative tool and are endeavoring to incorporate it into their own services. VR can be used in many different ways. There are a number of companies that offer VR gaming with immersive multiplayer games that can be enjoyed with others worldwide. Others offer social chatrooms in any landscape imaginable with visuals that feel as if you are really there. VR has become so popular that even real world events like sporting events and concerts are streamed over the virtual platform for people to tune in as if they are actually attending the event in real life. For older adults, virtual reality can serve as an innovative and fun way to interact with the world and others around them. Older adult users can interact with their loved ones in their own home, whether it be competing in games or traveling together in a virtual world. VR can be seen as a therapeutic escape for those who may be unable to leave their homes due to a lack of mobility or accessible transportation.5 Users can visit familiar landmarks or countries they may have traveled to in the past, or they can view the world from space. Whatever the choice may be, VR can be used to comfortably improve the quality of life of older adults, allow them to feel a sense of belonging, and enrich their relationships with others.